To the uninitiated an agility course seems a rather peculiar addition to an inner city dog park and yet here it is, dockside at Hamilton’s Hercules St Park. Stretching 2, 030 square metres the park incorporates a variety of challenging apparatus into ample green space, ensuring every hairy visitor has an engaging experience. Being unfamiliar to the sport of dog agility the equipment seemed to be all bars, poles and platforms to me but with some investigation I’ve learned that each item has, not only a name, but also a specific intention. Upon entry of the park you are greeted with a series of jump bars. Apparently, all agility tasks are intended to mimic a dog’s natural hunter-gather behaviours (Prajer, 2014). Thus, the jump bars act as quasi logs, grass and/or small shrubs; the types of small obstructions dogs would encounter when chasing prey in the wild. To the right of the bars is a pause table, dog walk and also an A-frame. In competition the pause table tests a dog’s ability to jump, assume and hold a position, as they would when stalking prey, whereas the dog walk and A-frame mimics the steep slopes of wild terrain. The final items in the park are weave poles, which, as the name suggests, are erect poles spaced appropriately apart, which the dog is required to negotiate at pace. This obstacle improves the dog’s dexterity and assumes the role of trees and other barriers that canine’s would meet in the outdoors. However, agility training isn’t just for the four-legged dog park goers, as the sport also requires human companions to race alongside the dogs instructing and encouraging them as they perform each task, making the experience a valuable exercise opportunity for dog and owner. Canine caregivers also have a variety of options when it comes to opportunities to relax, be it in a picnic shelter; on park benches or plentiful grass -although I’d beware of possible existing, smelly ‘deposits’ before I reclined on the grass in any dog park. Other facilities at the park include two entries, water bubbler, tap and dog water, poo bins and poo bags. Within the park proper precinct there’s a playground, toilets and additional picnic facilities. The park is located at 40 Remora Rd in Hamilton, just a stone’s throw from Portside Wharf. So it seems, taken collectively, Hercules St Park offers the best of both worlds – an inner city, vibrant lifestyle, parallel to the call of the wild. 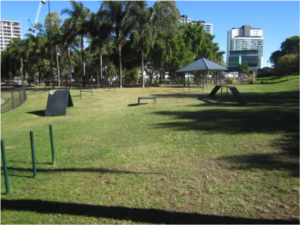 The agility course and open space offers the family pooch a chance to socialize, stretch their legs, express their natural instincts and encourage their best friend to join the energetic party.